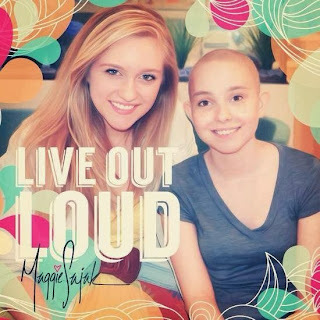 (Nashville, Tenn. – October 9, 2013) – Country music newcomer Maggie Sajak has released a special track called “Live Out Loud,” inspired by Muriel Walters, a 16-year-old girl battling cancer at Johns Hopkins Hospital. This past summer, Sajak met Walters through Music is Medicine’s “Donate a Song” project, which pairs songwriters with pediatric cancer patients. After spending time with the young girl, Sajak and Michael Lord co-wrote “Live Out Loud,” a ballad about living for the moment and enjoying life no matter what it throws your way. Sajak re-visited Muriel a few weeks later to premiere the tune for her and captured the meeting on camera, a moment that is featured in the “Live Out Loud” lyric video. To watch the lyric video, click here. To purchase “Live Out Loud” on iTunes, click here. The lyric video comes after the release of Sajak’s current single, “Wild Boy.” The track is at Country radio now and can be found on iTunes here. Sajak released her first single, “First Kiss,” when she was 16-years-old. The song was featured in two Country Music Television productions and the Hallmark Movie Channel flick, “Our Wild Hearts.” Now 18, Maggie is writing and recording music in Nashville for a full-length album, which is set for release in the spring of 2014. For more information, please visit www.MaggieSajak.com and follow her on Twitter and Facebook.